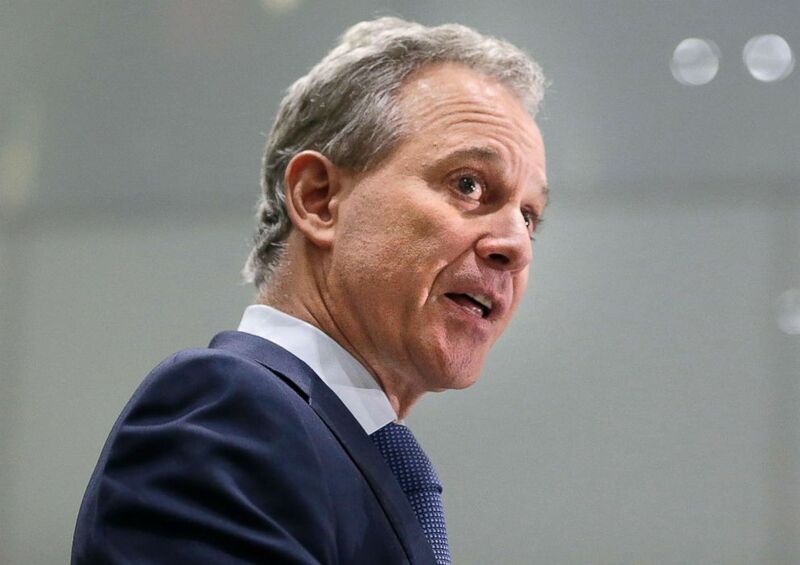 Did Donald Trump ding Eric Schneiderman's legal arguments when he started a years-long feud with the now-resigned New York State Attorney General? Nope. He went after his looks. Specifically, Trump said the state's top lawmaker wore eyeliner. "It's Thursday. Which brand of eyeliner is the nation's worst AG @AGSchneiderman wearing today?" Trump wrote in a June 2014 tweet. It’s Thursday. Which brand of eyeliner is the nation’s worst AG @AGSchneiderman wearing today? Trump wasn't unique in this critique, as a New York Times story from earlier that year pointed to sources saying that Gov. Andrew Cuomo had asked in an apparent dig at his fellow Democrat. The Cuomo anecdote appears to have informed some of Trump's jabs, but those weren't the only ones he directed at Schneiderman. A review of Trump's tweets shows that he called Schneiderman a "lightweight" in 44 tweets between August 2013 and February 2015. He also asked his Twitter followers if Schneiderman was a crook three times, called him either a crook or crooked four times, and called him a loser four times. The name-calling from Trump came on the heels of a 2013 lawsuit Schneiderman's office filed against Trump over his eponymous "university." The Attorney General's office sued Trump "for swindling thousands of innocent Americans out of millions of dollars through a scheme known as Trump University," a subsequent statement from the office stated. 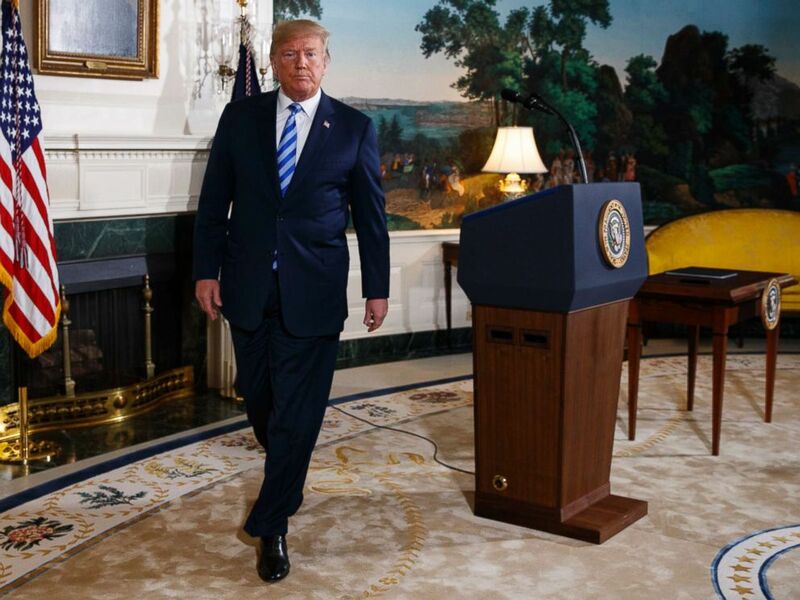 Donald Trump walks off after delivering a statement on the Iran nuclear deal from the Diplomatic Reception Room of the White House, May 8, 2018. Fast forward three years and a presidential campaign later, and Trump agreed to a $25 million settlement. The settlement was first announced in November 2016, without Trump making any admission of wrongdoing. Then-President-elect Trump said that the settlement was "for a small fraction of the potential award because as President I have to focus on our country." In Schneiderman's statement after the settlement, he said:"Donald Trump fought us every step of the way, filing baseless charges and fruitless appeals and refusing to settle for even modest amounts of compensation for the victims of his phony university." Schneiderman's probes of Trump-related endeavors didn't end there. His office previously investigated the Trump Foundation over alleged improprieties. New York Attorney General Eric Schneiderman speaks at a news conference in New York, Sept. 6, 2017. Schneiderman's investigation into the Trump Foundation started in 2016 over a donation that was made to a political fundraising group associated with Florida Attorney General Pam Bondi. Schneiderman ordered that the foundation stop fundraising in late 2016, for violating state law by seeking donations without proper authorization. Schneiderman's investigation determined that Trump's personal charity had failed to register with the state as a charity. The foundation was shuttered in November 2017. Schneiderman's actions didn't solely target Trump businesses. Through amicus briefs and other legal actions, New York's Attorney General had taken on Trump policies from the environment to immigration. In September 2017, Schneiderman issued a joint statement with Gov. Andrew Cuomo threatening legal action against the White House if the Trump administration ended the Deferred Action for Childhood Arrivals, or DACA, program.